>>> What to Do Differently to Keep Your Pet Healthy? 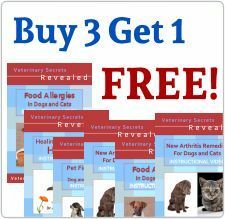 In this book you'll find what you need to know about feeding your pet, vaccines to give and vaccines to avoid, along with specific conventional medications to be wary of. The book offers ways to treat your pet at home with holistic options that can and will likely extend your pet's life. The primary problems contributing to the epidemic of pet disease, and what you can do differently. Dr. Jones earned a doctor of veterinary medicine degree from the University of Saskatchewan and treated thousands of animals over the course of seventeen years. He is the former owner of Nelson Animal Hospital in Nelson, BC. With a focus on nontraditional pet remedies, Dr. Jones has written books and articles on home pet health care and developed a home study course for dog and cat owners. He has also formulated a line of premium nutritional supplements for dogs and cats. With over twenty thousand copies of his e-book Veterinary Secrets Revealed sold, it's clear that Dr. Jones is still making a positive impact in the world of veterinary medicine - and in the lives of pets and pet owners around the world.